I am a runner. I am a newbie runner that once dreamt of running the distance, and eventually, a marathon. And now almost 11 months since I took that first step on my first ever race, God was gracious enough to allow me to fulfill a dream that I used to only imagine. For the past 11 months I was able to run distances from 5K to 100K but I saved the marathon for last. I have the utmost respect for the marathon, and truth to be told, I dread it the most. Yes, an ultramarathon is longer in terms of time and distance, but only a marathon pushes the boundaries of the human confines to its limits—both physically and mentally. No time for rest or drama—just grueling run. And now the time to face my fears have arrived—it’s do or don’t. It was a dreadfully calm day before the race—nothing much to take my anxiousness away from the impending. As that day was calm, race day was a complete inverse—because of “human factors” that surround the race that were beyond my control I eventually found myself four or so minutes late from gun start despite arriving at the area half an hour early. Suddenly there was no time to spare and think—just find someone to check me in and run—it was a racer’s worst nightmare coming true! Mental override was the only thing that stopped me from running frantically. I guess its instinct for me to run fast when I’m running late, but then again this is a marathon—there’s no place for blunder. If I was to survive this marathon my mind has to be as active as my body—there’s no such thing as an autopilot. Unfortunately due to some inconsistent reading I got for my actual pace, it took me four kilometers before I was able to run at my target pace. I was running the first kilometer in 5:02 pace and the next three in 5:30 average pace—without speed training I knew that a burnout was imminent. The target time of a sub-four hour run was still mathematically feasible on my first 10K, but not very realistic. I was 2.5 seconds off my target pace and with no more upcoming flats and the expected fatigue, I was determined at that point to push it at far as I can—a pretty time was no longer the priority. Mary (marathon) was slowly showing me why I was right to dread it as it slowly depletes me—it was a mind over matter game. I was feeling the loneliness of solitude when suddenly I heard loud cheers from afar—it was my friends, all in red, rooting for me! Our minds can only do so much and seeing your friends like that really boosts your morale. I was glad at that moment to have friends that share the same passion as I do, and at that time a lot of them were there. I thought that I had “graduated” from walking in races but Mary proved me wrong as I approached the foot of Kalayaan flyover. I was seeing my pace gradually slowing down to that point until I got flat on the flyover’s ascent—before I knew it I was walking! Another point for Mary. Lawton Ave. saw many runners walking—Mary was taking its toll on a lot or runners, and it was just a bit more than halfway! By this time the sun was shining brightly which was not a very good sign for us runners. Marathoners (to be) Love the Rain! Upon entering Bayani Road something wonderful happened—rain! Definitely this was one of the most enjoyable moments of the race—I totally forgot about the world—it was just me under the rain running. Too bad that it didn’t last for the entirety of the race and before reaching Heritage Park it stopped—the sun is back for Mary’s reprisal. The sun was back and I was missing our support group. By that time I should’ve seen another group in red but alas I haven’t seen any. I was starting to lose hope of seeing the support group as I make my turn at the end of Bayani Road when I heard a biker asking me if I needed anything—there they were, two of my friends on bike! Again it was a relief to see my friends—it was only unfortunate that they didn’t carry what I needed but then I really appreciated the support. For the first time I was running without water nor any hydration solution going back from Bayani Road towards Lawton Ave. It was a worrisome moment—I was consciously budgeting my strength and speed to last until the next hydration station. Making the situation worse were my quads and the uphills—I felt at those moments that any wrong move may result in cramps. This of course resulted in the slowest pace I had in the race. Finally after refilling my lone hydration bottle I was able to cruise along Lawton Ave. with alternating walk and run. I was having pains on my right foot due to blisters, on my left underarm due to chaffing, some intermittent pains on my sides, etc. to add to the fatigue so at that moment my respect for the marathon just grew exponentially—finishing one really is anything but a walk in the park. My motivation at that moment was thinking of how little distance I need to finish the task at hand. Finally it’s back to the Kalayaan flyover—but before that came a pleasant surprise. The support group I was looking for was actually there just before the foot of the flyover! Finally I got a chance to eat an entire banana that I’ve envied from other runners that had a lot of support group. Finally in our own way I felt special—we may not have the biggest nor the most numerous support group but all of them are volunteering from the heart. > And what a challenge it really was! Thanks Rach! 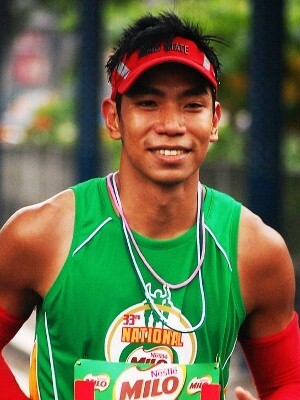 nice article,i’m treading the same path as yours,i’ve started the fun run this year starting with 5 k gma fun run,2.k philippine star fun run and the upcoming the 21k goldilocks fun run.looking forward to join the marathon in the future.thanks for sharing your passion and inspiration,i really appreciate it.